• For sensitive determination of NAD and NADH and evaluation of drug effects on NAD/NADH metabolism. Direct NAD/NADH Assays in 96-Well PlateNEW!!! • Pyridine nucleotides play an important role in metabolism and, thus, there is continual interest in monitoring their concentration levels. Quantitative determination of NAD+/NADH has applications in research pertaining to energy transformation and redox state of cells or tissue. BioAssay Systems EnzyFluo™ NAD+/NADH assay kit is based on a lactate dehydrogenase cycling reaction, in which the formed NADH reduces a probe into a highly fluorescent product. The fluorescence intensity of this product, measured at λex/em = 530/585 nm, is proportional to the NAD+/NADH concentration in the sample. This assay is highly specific for NAD+/NADH with minimal interference (<1%) by NADP+/NADPH and is a convenient method to measure NAD, NADH and their ratio. Direct NAD/NADH Assays in 96-Well PlateNEW!!! 1. Can I determine NAD/NADH directly in 96-well plates? 2. When tissue is used, should it be freshly obtained? Or is -80?C storage ok? 3. I have conducted protocols that involve trypsinizing cells, washing with PBS, pelleting, and then applying extraction buffer. My concern with this method is that PBS is known to cause mitochondrial fragmentation very soon after application to cells. Obviously, the functionality of the mitochondria is very important for NADH/NAD levels. I developed an alternative by keeping my cells adhered to the plate, washing once with pbs, applying heated extraction buffer to the cells directly and then scraping cells off. Do you have any thoughts or experience that would indicate whether one method is better than the other? The second method is better because the first method may cause mitochondrial fragmentation and thus may alter intracellular NAD/NADH concentrations. The second method involves less pretreatment. Adding the heated extraction buffer terminates the metabolic reactions in the cells and is thus much less likely to alter the intracellular NAD/NADH concentrations. 4. I have also done many experiments with different numbers of cells. 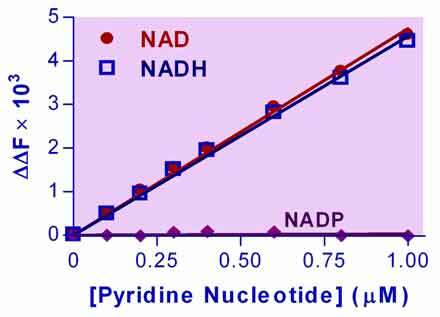 What I notice is that there seems to be a sigmoidal relationship between the number of cells and the NAD and NADH concentrations. I am using C2C12 and H9C2 cells. Do you have any experience with these cells at different seeding densities? Also, do you consistently see a relationship between number of cells NAD(H) concentrations? Is this relationship linear, exponential, sigmoidal? We have not done these experiments. Your results are very interesting, and not unexpected. In general, cells are healthy at certain densities. When cells lack contacts for a healthy environment at low density, they are likely to produce less NAD/NADH, and if too dense, the cells become less active and thus would reach a plateau in NAD/NADH concentrations.